Okay, so this meal planning week is a doozy for me- LOTS of abnormal, but good things going on! We are having our neighbor friends over for an easter egg hunt at 4:00 p.m., so I am hoping the snacks/drink will turn into "Hey kids, this is your dinner! "- that is my goal anyway. One neighbor is bringing sangria (and snacks)...aw yeah! Already shaping up to be a good time by kids and adults. Making these Sausage Balls with Bob's Red Mill gf Bisquick Mix- my friend Jenni made this last week at her daughter's birthday party and my kids ate a TON of these. 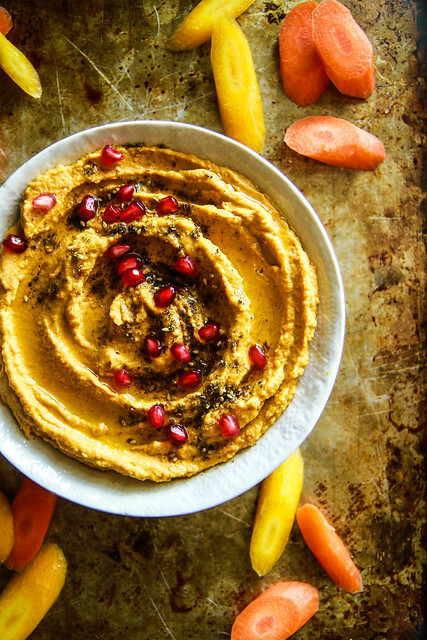 Also making Roasted Carrot Hummus serving with chips- that would be weird to serve with cut up carrot right? ; ) carrot + more carrot...probably not. I am going to use almond flour instead of the breadcrumbs. And how can you celebrate Easter without Healthy Deviled Eggs ? I even have the cute deviled egg platter that I get to use...oh, about once a year! But glad I have it. I totally made this dish last week and it was so good and easy that I am having yet again this week. You will be glad to add this to your slow cooker recipes! 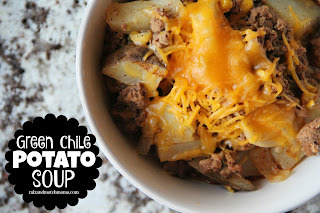 Green Chili Potato Soup- Instead of taco seasoning, I add my own cumin + chili powder. And I will put out cheese and cup-up avocado for toppings. Oh and tortilla chips! Tonight is our normal small group night at our church and our last official one *sniff* for the spring semester. It is bring a dish- so I am bringing some roasted veggies. 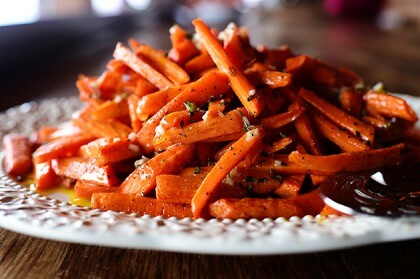 Roasted Carrots with Vinaigrette- It is a Pioneer Woman recipe- so, usually hers are great! I have used this one a ton. Honestly, I don't use the fresh herbs...I just use dried herbs. I don't keep those herbs on hand and that is one of the things that help me keep in my budget! Keeping dinner tonight SUPER simple because it is the end of the month and trying to stretch budget money and I am taking two meals to friends this week...so, there's that. So, here is a cheapo meal. 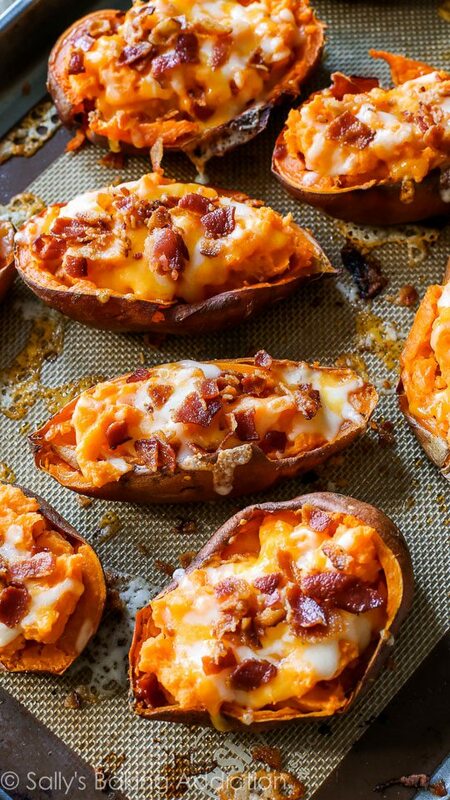 Loaded Sweet Potato Skins - I will likely modify them- use almond milk instead of regular- keep the bacon, probably no cheese and make them on the sweeter side- with some cinnamon and maybe a little honey. So, following this recipe very loosely. Taking a meal tonight to a family who just had their 2nd baby! 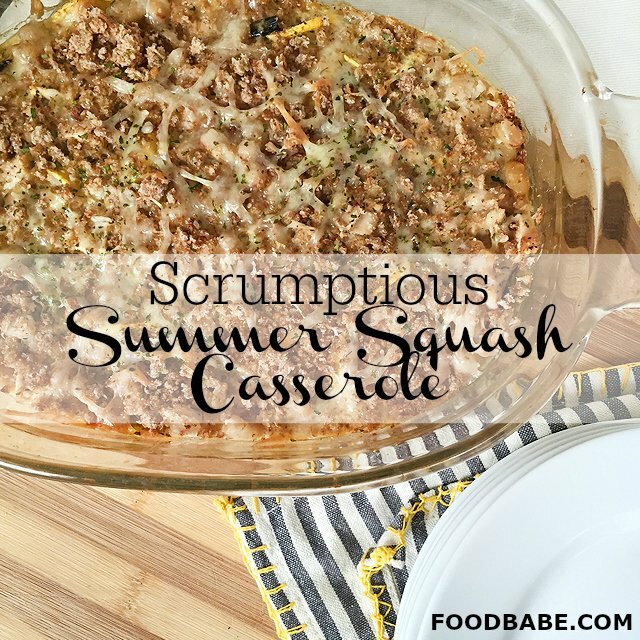 This is a go-to and I posted about this in my one-pot meals post. I will double it for our family as well- by double it I mean make two separate pots of it. Brazilian Rice and Beans - just click on the link and scroll down for the recipe. Also, bringing a Mexican salad- it is so light and refreshing. This is my recipe, so I need to post that on its own...but here ya go! Mix oil, lime juice, garlic, salt and pepper in a 2 1⁄2-qt serving bowl. The yield from 2 average ears of corn is 1 1⁄3 cups kernels. I haven't take a picture of it but will soon! Bringing tortilla chips as well. Taking another meal to a family tonight- will double this as well for our family. Cook brown rice according to directions on package. Pull the chicken off the bone/chop the meat. Set aside in a serving bowl. Heat 1 tbsp olive oil over medium heat in a medium skillet. Cook for 10-15 minutes, stirring occasionally. You want them to get all caramelized/softened. Set those aside in a serving bowl. Heat 1 tbsp olive oil over medium heat in a small saucepan, add diced onion and minced garlic. Cook for approx. 5 minutes until onion is softened. Add black beans, cumin and salt to taste (I also will add Adobo seasoning for more flavor). Cook uncovered for about 10 minutes, stirring occasionally. Mix black beans and brown rice together in a bowl. Make the simple guacamole. Take avocado and mash with 1 tbsp of chopped cilantro, juice of 1/2 lime (or a whole lime, depending on how "limey" you like it and salt. We have an Easter tradition of blowing the insides of eggs out and then decorating and hanging them on a "tree"- we gather branches outside for this. I bought brown eggs, like I normally do, and didn't think anything of it. I even set up the dyes and we were ready...then I realized wait! Dying brown eggs is not going to work....womp womp. 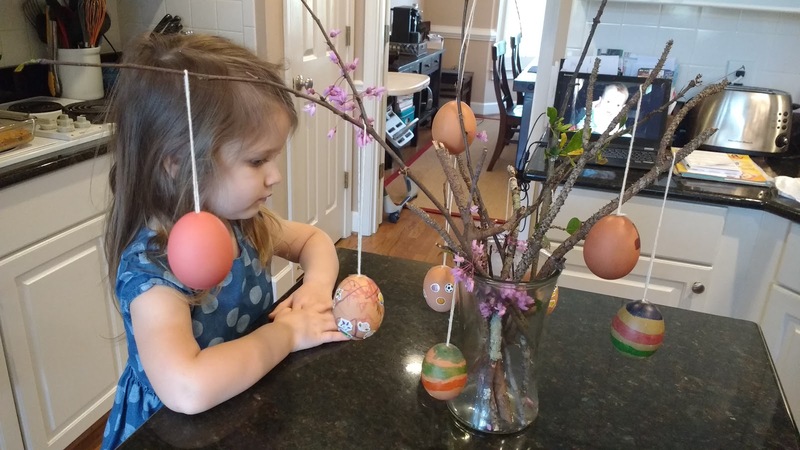 So, I leave you a sort of "Charlie Brown" Easter egg tree.